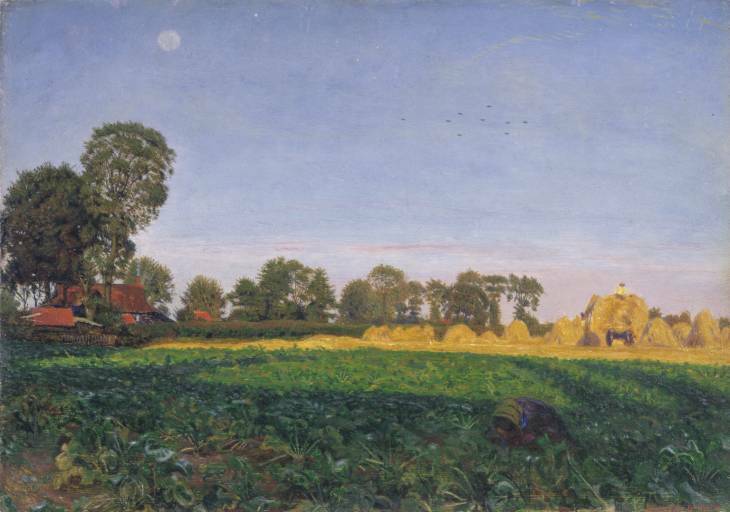 This intensely coloured painting captures a harvest field just before sunset. Each landscape element is faithfully recorded in jewel-like colours. This is a nostalgic view of rural England, untouched by industrialisation and modern city life. Ford Madox Brown’s view is typical of idealists of the time who believed that an engagement with nature offered spiritual redemption from urban corruption. Brown and his family were facing financial hardship at the time this picture was painted. It was one of a number of ‘potboilers’, modest and straightforward landscapes he hoped would sell easily. Thomas B. Seddon - Mount Zion. The Beloved - written by Stephanie Pina.